Those high summer temperatures have finally inspired you to take the plunge and get that swimming pool built in your own backyard. Now comes the time to face one the most challenging parts of building a pool – finding the right swimming pool contractor for you! Installing a pool can be quite a strenuous process, but the surest way to make it even more challenging is to work with a swimming pool builder who is less than reliable. Swimming pool professionals will offer a wide range of estimates, and it shouldn’t amaze you to know that you usually get what you pay for. So if you find an estimate for your pool that is absurdly cheap, chances are you will get something cheap or worse in your yard. As with any large undertaking, you want to research the potential pool professional before you hire and put money down. 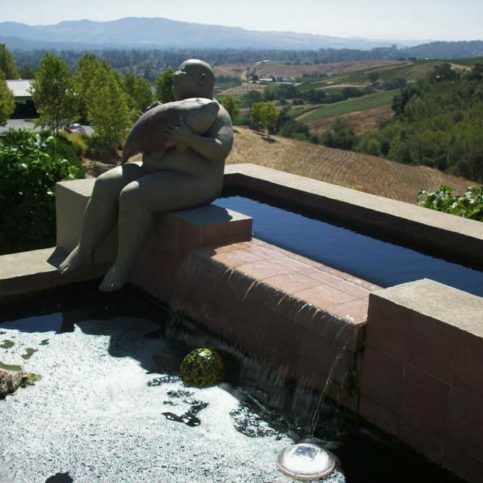 Here is some advice to help you get organized in beginning your search for a Napa Countypool contractor in the major cities like Napa, American Canyon, St. Helena, Calistoga, and Yountville, and including the smaller towns of Angwin, Calistoga, Deer Park, Oakville, Pope Valley, Rutherford, that hopefully will help you in become a delighted swimming pool owner in the near future. 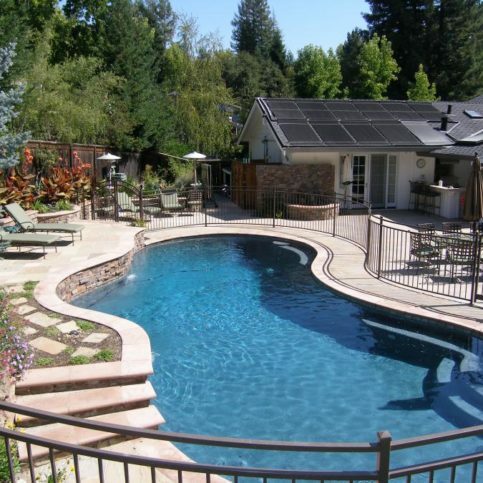 Review the web sites of some Napa Countypool contractors. Watch for styles and/or designs that you like. Select some swimming pool companies to contact. Confirm the contractor has a CSP Certified Service Professional as an employee (this can’t be awarded to companies). The National Spa & Pool Institute will train, test and retest pool technicians before they can be certified as a service professional. Then they are designated Certified Service Professionals (CSP). Never be in a hurry to make a decision. Make sure you comparison shop. Always get bids from different companies. Make sure you read all the written materials that are given to you. Be cautious of any pool builder who requires a considerable down payment, or one who wants high percentages of the contract paid before very much of the work has been done. The Registrar of Contractors gives standards for payment on their Web site. Swimming pool builders (C-53 contractors) must learn certain skills in order for them to build pool, hot tubs, and install heating equipment. 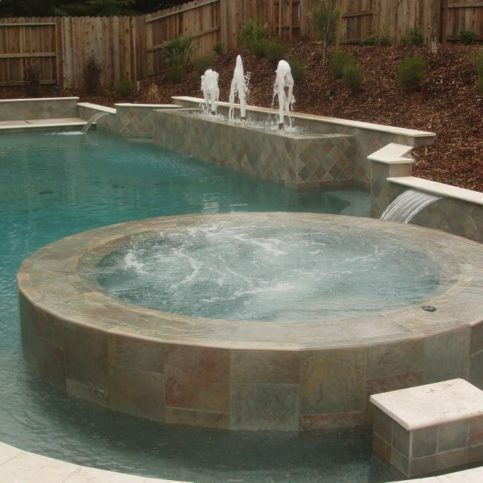 More precisely, with these skills they can install the basics in ground pools, above ground pools, and many types of custom pools for homes and commercial settings. Some of these contractors will even have experience in more advanced jobs, like waterfall pools, vanishing edge pools, and hillside pools. If you have any worries about draining too much energy or other negative impacts on the environment, you may look for a swimming pool specialist with experience in energy efficient swimming pools that are solar heated or perhaps temperature controlled. 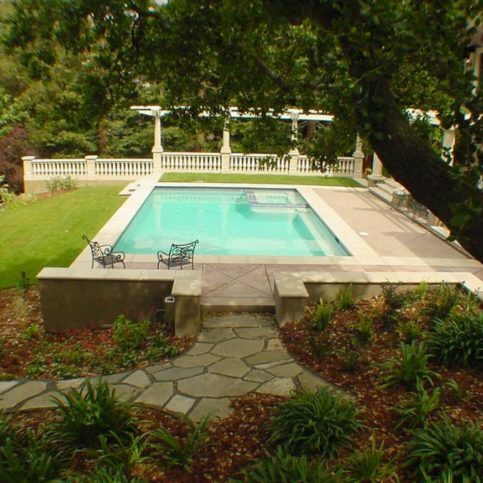 Most Napa County pool builders will also work on existing pools. An older pool may need a little or a lot of renovation, which could include relining, gunite replacement, pool plastering, or concrete work. Pool contractors can do all of this. If you need major renovations, expert contractors can even produce a custom redesign based on your current layout. When you plan a budget for your new pool, you may want to think about adding accessories that will make it even more entertaining. Your swimming pool builder will have many options that they can install besides the swimming pool. Stairs, slides, ladders, and even diving boards are great additions for more fun at the pool. 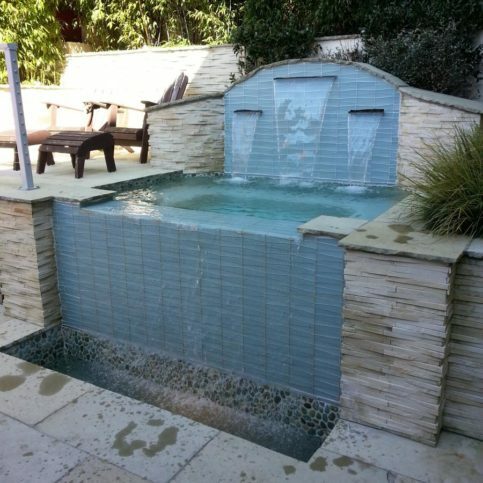 You can enhance the surroundings with waterfalls, specialized interior finishes, or other water features. Mechanical and electrical systems can also be installed. These systems could include fiber optic pool lighting, computerized systems, cameras for the pool, regular filters, solar pumps, automatic safety covers, and other systems. Why Trust Diamond Certified Swimming Pool Contractors Rated Highest in Quality? 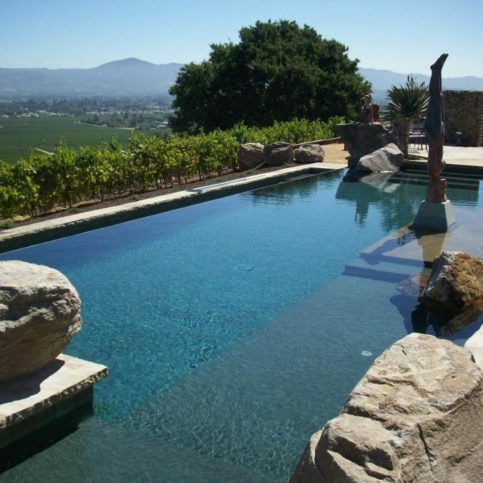 Only the best swimming pool contractors in Napa County have earned the Diamond Certified award by scoring Highest in Quality in the most accurate and rigorous ratings process anywhere. You’ll never be fooled by fake reviews, since all research is performed by live telephone interviews that verify only real customers are surveyed. Most companies can’t pass this test. That’s why you’ll feel confident when you choose a Diamond Certified swimming pool contractor listed below. Simply click on the name of a Diamond Certified company below to read ratings results, informational articles and verbatim customer survey responses. Val Toland is a 37-year veteran of the swimming pool construction business and owner of Classic Pools, a Diamond Certified company. He can be reached at (925) 201-6120 or by email. A: Ruth’s Chris Steak House in Walnut Creek. A: Catch up on little projects and chores around the house that I usually don’t have time to do. Q: If you could time travel to the past or the future, where would you go? A: I’d go to the past and try to correct an injustice or prevent a tragic incident from happening. Classic Pools recently installed this infinity pool in a client’s backyard. 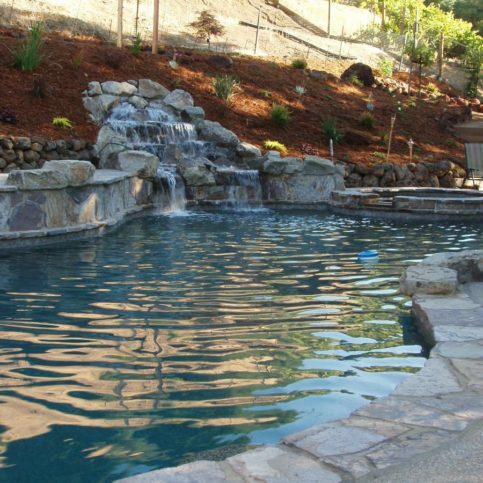 Once you are ready to build a pool and hire a swimming pool company in Alameda, it is important to know what you want. Unfortunately, many pool companies are less than professional and do not meet the standard of swimming pool building that is required. Use the questions below to help you define what you really want from a pool contractor and you are almost guaranteed to find the most reliable and responsible swimming pool company. The benefits will be well-worth it! What area of the yard will the swimming pool be situated? Do I want a reputable company that is fully insured and bonded? Do I want a company that uses environmentally friendly supplies? Do I want a building contractor to provide swimming pool building services on a one-time basis only or will you need regular maintenance? 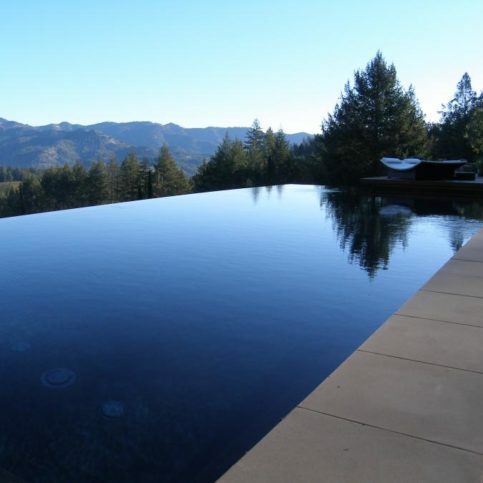 After questioning numerous Napa County pool builders on the phone, you will want to whittle down your list of prospects in Napa County, including the larger cities of Napa, American Canyon, St. Helena, Calistoga, and Yountville. Visit those few final prospects in person with your preliminary plans for your swimming pool. Consider the following questions to help you obtain critical information. Is your personnel BCSP certified by the National Spa and Pool Institute? Will you need permits? If so, who is responsible for getting the permits? Will you hire subcontractors or will you do the work yourself with your own employees? How will you clean up and when will you clean up? What type of warranty do you offer? What will it cover? How will I pay for the pool? 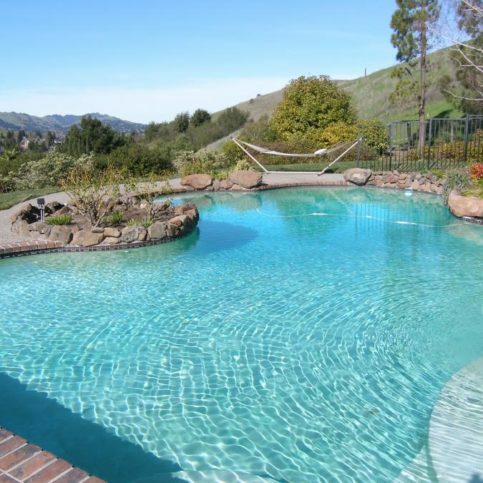 How many pools have you completed in Napa County? Do you type of swimming pools do you specialize in? Do you have any energy efficient or environmentally friendly swimming pool building materials? How long do you expect it to take to construct the swimming pool? It’s best to choose a Diamond Certified swimming pool contractor because all certified companies have passed an in-depth ratings process that most other companies can’t pass. 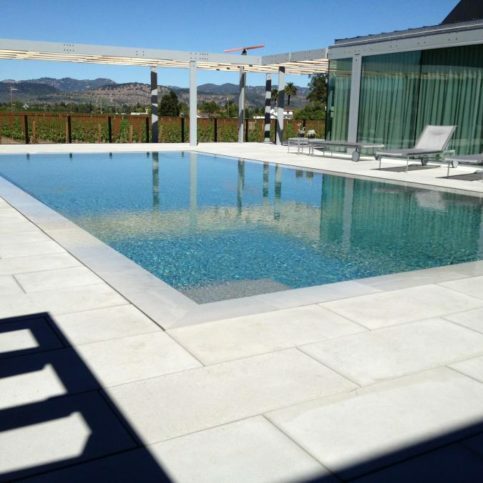 If you want quality from a swimming pool contractor in Napa County, you can have confidence choosing a Diamond Certified company. Diamond Certified reports are available online for all certified companies. And you’ll never be fooled by fake reviews. That’s because all research is done in live telephone interviews of actual customers. If you can’t find a Diamond Certified swimming pool contractor within reach, you’ll have to do some research on your own. If you do, it’s wise to call some references provided by your swimming pool contracotr. Keep in mind, though, that references provided to you by the swimming pool contractor are not equal in value to the large random sample of customers surveyed during the Diamond Certified ratings process. That’s because references given to customers from companies are cherry-picked instead of randomly selected from all their customers. So the contractors will likely give you a few customers to call that they know are satisfied. If you do call references on your own, specifically ask for a list of the company’s 10 most recent customers in Napa County, in the major cities of Napa, American Canyon, St. Helena, Calistoga, and Yountville. This will help avoid them giving you the names of only customers they know were satisfied. If you live in smaller towns such as Angwin, Calistoga, Deer Park, Oakville, Pope Valley, Rutherford, did they charge extra to travel to your home? When you need a swimming pool contractor in the future, will you consider hiring this pool contractor again? Would you recommend this swimming pool contractor to your friends and family? Were you satisfied with the services from _(swimming pool contractor)_? Did the swimming pool contractor you hired finish the work on time? Did the contractor keep you up-to-date with the status of the project? Or did you have to call in order to get information? 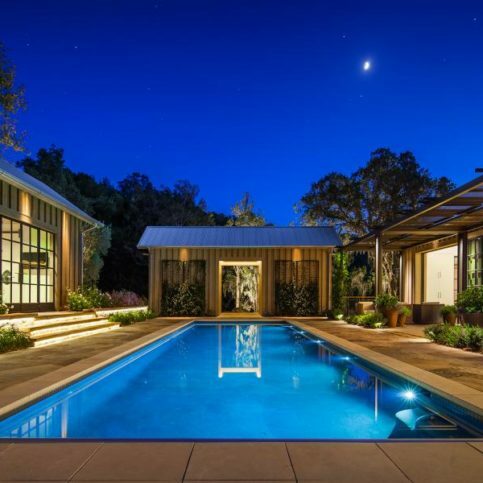 Can the swimming pool companies in Napa County meet your needs when it comes to scheduling, products, techniques, customer service and experience? Are the swimming pool contractors knowledgeable about the brands and techniques they use and on the specific needs of your job? Do the swimming pool contractors you questioned offer written warranties that back up their work and products? When you find a local swimming pool company that meets all your ideals, it’s the perfect time to ask for a written contract. This contract should include written details on the price, quality and materials to be used, as well as the job start date and intended completion date. When signing the contract, don’t be afraid to write in special requests or verbal agreements. This will protect you and help ensure you get the services you have agreed on. Along with end dates and any special instructions, these add-ons may also include related issues that aren’t always covered by a standard contract. For example, regardless of how careful your contractor promises to be, rutted lawns, damaged shrubs and crushed flowerbeds are often unexpected results of exterior swimming pool jobs. But you can protect your property by being proactive. Before the work begins, schedule a walk through with the company supervisor and conduct a pre-work inspection of your property. List or photograph your landscaping, home and property and talk with a company representative about reasonable expectations for protecting your home and yard during the work. When you’ve reached an agreement, both you and the contractor should sign and date the document. When the work is done, do a concluding inspection together and verify that your expectations were met. 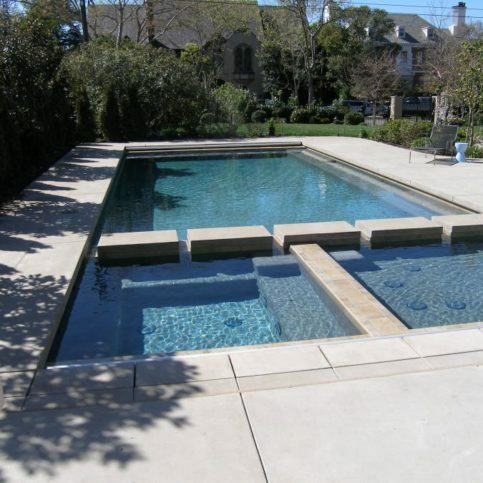 Professional pool contractors are able to handle the large and small aspects of their work. But there are a few things you can do in preparation to their arrival and while the work is in progress to help their job go more smoothly. You may even cut down on billable hours or the possibility of damage to your home and belongings. Remove any outdoor furniture or movable items from the workspace.. Anything that’s cannot be removed from the pool area should be moved as far away as possible from the construction area. You may also want to temporarily store any costly items that are in high-traffic areas of your yard to prevent them from being broken. Provide adequate clearance and parking space for work trucks. Some swimming pool companies have large work trucks that require more clearance or parking space than average vehicles. Contact the company before the scheduled start date and ask them how many work vehicles will need parking space and whether the vehicles are oversized. You may find it helpful to walk through the site with your contractor ahead of time so they can point out any potential clearance issues or possible hazards you can move or minimize before the pool construction begins. Trim plants and bushes outside your home before the swimming pool is installed. You may be able to save time and money by trimming trees, bushes and other plants that are close to your home’s exterior. Talk with your contractor about the amount of space they require around the perimeter of the job. It’s the swimming pool contractor’s responsibility to put in quality swimming pools using the best possible installation techniques. 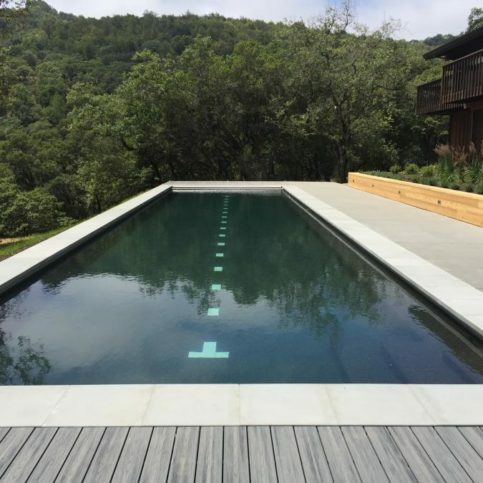 But you play a big part in the success of your swimming pool, to pool contractor in the major cities of Napa, American Canyon, St. Helena, Calistoga, and Yountville. Be sure your service representative has a phone number where they can reach you at all times while they’re installing the swimming pool. The work will move along more smoothly if your swimming pool company can reach you for any necessary updates, questions or work authorizations. When your contractor contacts you, return calls promptly to keep the installation of the swimming pool on schedule. Pay for the swimming pool work on time. Be clear and upfront with the swimming pool contractor. Let them know what you want from your swimming pool, the long-term outcome you’re expecting and specific ways they can satisfy your expectations. Before you hire a swimming pool contractor in Napa County, restate your expectations and goals, and reiterate to the swimming pool contractor representative your understanding of the agreement. Most problems with local swimming pool contractors occur because of a breakdown in communication. By being clear about your expectations and theirs, you can avoid most conflicts. Ask your swimming pool contractor if you should call to check on the progress or if he will call you with updates. Why would you want to be a good customer? 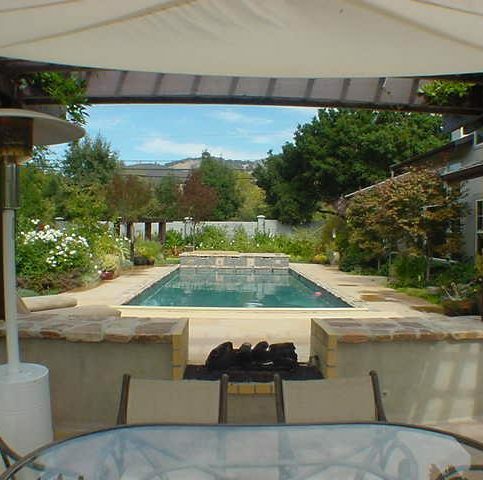 Swimming pool contractors in Napa County appreciate customers who are straightforward, honest and easy to work with. Your good customer behavior sets the tone from your end and creates an environment conducive to a good relationship. Things may very well go smoother and any problems may be more easily resolved. Any applicable warrantees or guarantees provided by the swimming pool manufacturers and the company. The contractor’s name, physical address and license number. The total cost for swimming pool services, including the amount due for labor. An itemized list of the swimming pool and the pool supplies purchased. It’s smart to compare the completed work to what was promised on the written invoice. Ask your company representative to walk through the job site with you and show you the work. Check what was done against the invoice. During the walk-through, ask if there are any special instructions for maintaining your new swimming pool. If you have questions about the work that was done or the materials used, now is the time to ask. If the warranties are transferrable to the new owner if you sell your home. What products and services are covered. This should also include whether the contractor will replace or repair your new pool and its parts in the event of a product failure. Terms, limitations and exclusions on the swimming pool, materials and workmanship. 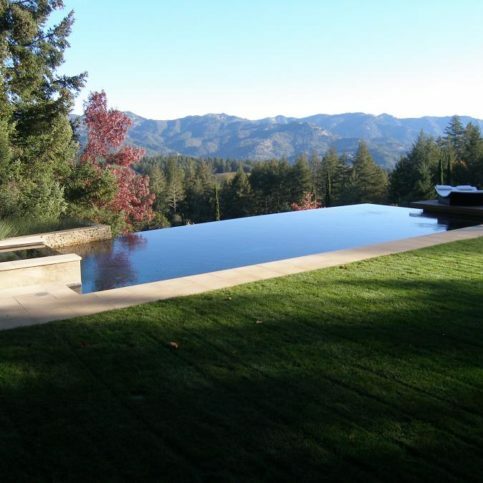 The top 10 requests for swimming pool contractors in Napa Countyare listed below. Designs of inground swimming pools as far as shape and contour. Swimming pool built into the ground which usually have a gradual depth. These can be made with fiberglass or cement. 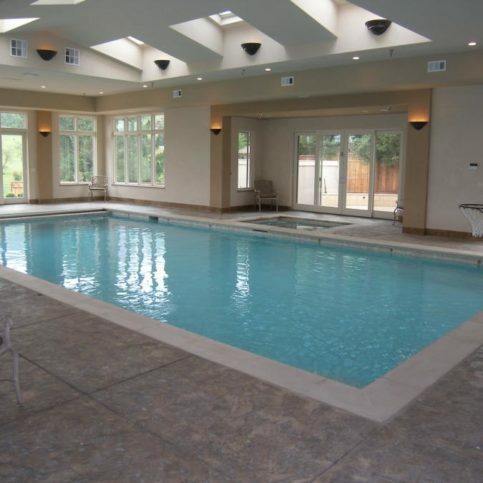 A swimming pool made with fiberglass that is created less likely to crack or require any future repairs. These pool are also more flexible than a cement pool. Fiberglass is more suitable for colder areas. Swimming pools that can be custom designed with limitless options for shape, features, and configurations. Liners made for swimming pools typically made of plastic or similar materials. Caring for the upkeep of swimming pools, both aboveground and in-ground. These services include adding chlorine and other chemicals to pools, winterizing the pool, getting pools ready for the season, and vacuuming the pool. Supplies to maintain the pH of the water, the pump and its parts, the cleaning of the filters, the upkeep of the pool equipment, and other accessories that aid in the upkeep of the swimming pool. Designs of pools as far as shape and contour. With custom designing the options are endless. The installing of an above ground or in-ground enclosure intended for the containment of water. This structure is designed to be used for swimming, wading, or other recreational use. Swimming pools that are built above ground. 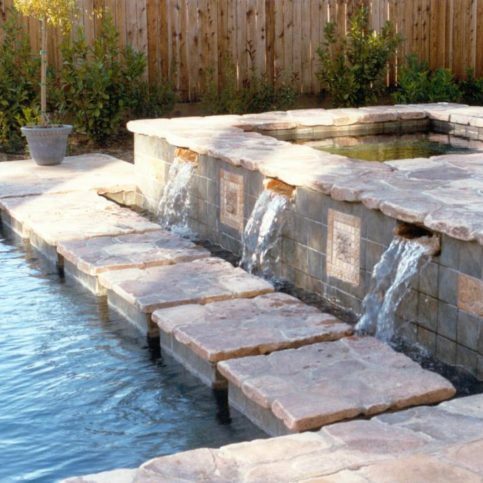 These pools are less expensive are typically round or rectangular. Below are key swimming pool contractor terms and descriptions that will help you navigate your way through your swimming pool service from start to finish. Services for cleaning pool filters, maintaining the pH of the water, and maintaining the pool, pool equipment, and pool accessories, or a combination of these services for both above-ground swimming pools. Algae is a term for a variety of microscopic organisms which have features that are similar to plants. These organisms are fairly harmless, but they can significantly change the color of your pool water. If the algae gets thick enough, it can also damage the filter. Alkalinity is the opposite of acidity and can be referred to as total alkalinity. You can find test your pool’s pH to find its alkalinity. This can be done with test strips from a pool supply store. This is the process of reversing the flow of water through a pool’s filter so it can be cleaned. A term for liquid chlorine. This is similar to the bleach that can be used in cleaning laundry; however swimming pool bleach has three times the concentration of actual chlorine. A water-soluble white salt that is used to alter the hardness of swimming pool water. A term that describes the calcium content of swimming pool water. Water can be too “hard,” or not hard enough. When it is too hard, the water will not be comfortable to swim in. You could also see white calcium buildup appearing on your fixtures. When the water is not hard enough, it can corrode metals. There are many types of pool filters. The cartridge is the replaceable element of the pool filter, and it is usually made of polyester or sometimes paper. A material that is used to disinfect pool water. What is commonly referred to as chlorine is many times sodium hypochlorite. A term that describes the transparency of swimming pool water. When the water is not clear, it can be a sign that there is an algae problem. A cover for a pool or a spa that protects the pool or spa when it isn’t being used. A powder that is made up of thousands of single-celled organisms (fossilized diatoms). These tiny fossils are porous and make a perfect material for filtering impurities out of swimming pool water. Some of the most effective swimming pool filters on the market are DE filters. The pool drain is situated in the deepest part of the swimming pool This drain is connected to the swimming pool pump which circulates and filters the water. A swimming pool filter keeps the water clean and free from unhealthy particles. It cleans the pool water by running it through a porous substance (diatomaceous earth or sand) which pulls out impurities out. A term that describes the speed at which water moves through a swimming pool filter. Chemicals used for spas (hot tubs) to disinfect, sanitize, and continuously kill bacteria in the water. Designs of pools as far as shape and contour. With custom designing, the options are endless. Services for cleaning pool filters, maintaining the pH of the water, and maintaining the pool, pool equipment, and pool accessories, or a combination of these services. Swimming pools that are built into the ground which usually have a gradual depth. These are typically made with cement. Products that clean the pool either using the suction and the return lines or cleaning through the pool’s circulation system. The building of an above ground or in-ground outdoor enclosure designed, intended, or used for the containment of water. Also this structure is designed to be used for swimming, wading, or other recreational use. A building contractor who has a specialty license that is issued in the areas of excavation, structural, trim, decking, layout, piping, and finishes. Water impermeable paint that is specially formulated and has good wet adhesion. This paint is used to protect and also decorate the interior surfaces of pools. This mechanical device causes the water to flow under pressure to filtrate or circulate the swimming pool water. Services for treating swimming pool water, cleaning swimming pool filters, and also maintaining and repairing pools, pool equipment, and pool accessories or any combination of these services. 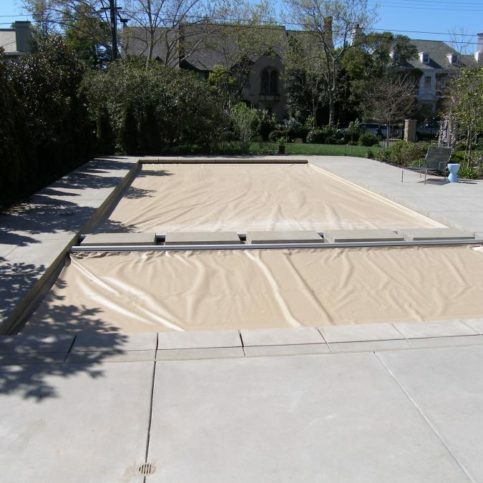 Services for swimming pools such as patching or possibly replacing a liner. Also these services could be repairing the underground or above ground part of the filtrations system, including the pump and its parts. Q: Why choose a Diamond Certified swimming pool contractor? A: Diamond Certified helps you choose a swimming pool contractor with confidence by offering a list of top-rated local companies who have passed the country’s most in-depth rating process. Only swimming pool companies rated Highest in Quality earn the prestigious Diamond Certified award. Most companies can’t pass the ratings. American Ratings Corporation also monitors every Diamond Certified company with ongoing research and ratings. And your purchase is backed by the Diamond Certified Performance Guarantee. So you’ll feel confident choosing a Diamond Certified swimming pool contractor. Q: What does the average pool cost to build? A: Usually the bigger you build a pool, the smaller the square footage cost will be. The cost of the average pool starts in the mid $20,000 range. 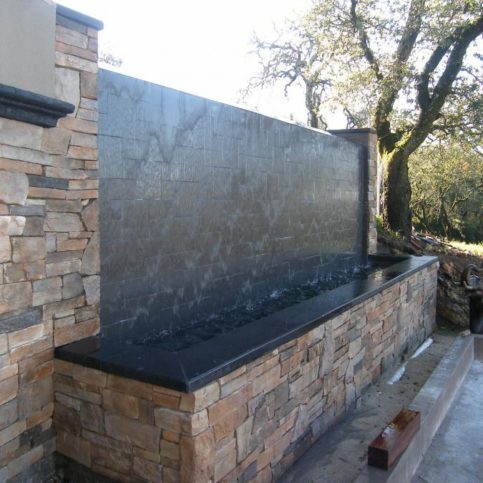 There are many factors that affect price besides the size: the selection of equipment and devices, the tile and coping selections, an addition of a waterfall or other water features, different types of stone features, the lighting choices, the finish selections, and the choice of decking. Q: What size is the average pool? A: Basic pool sizes begin at around 400 square feet and the sizes go up from there. Q: How long does the average pool take to build? A: The time it takes is dependent upon the size of the pool, the complexity of the design, and also the cooperation of the weather. The average pool can usually be completed in about six weeks. Q: How do I decide what type of pool is right for my family? A: First the pool size and kind will be determined by the overall size of your lot. As far as the shape and style that will depend on how you are going to use the pool. If exercise is an important factor, then you will need a pool where lap swimming is appropriate. If you want a pool that reflects an oasis in your backyard to relax or entertain, then you may be well-suited for a custom design. There are a variety of shapes to fit a multitude of different needs and lifestyles. Ask your swimming pool contractor for a selection of pool styles. Q: Can a pool be used year round? A: Yes , a quality pool can be used beyond the pool season. Regardless of the season, the swimming pool can be a centerpiece of great memories with your family and your friends that will last for years ahead. Enjoy your backyard oasis year round! Q: Should a new pool be built in the spring in preparation for summer? A: Demand increases in the spring and summer, so the months of November to February are actually a great time to build the pool. If you plan ahead with the building of your pool, you can make sure your swimming pool is ready to use those first days of warm weather. 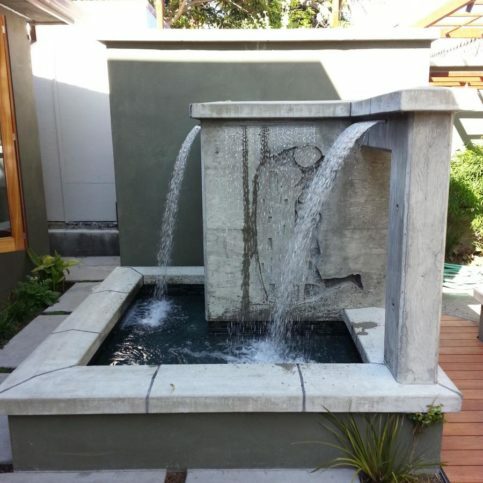 Q: What typical concrete finishes are offered for pools? A: There is a variety of concrete finishes: stamping, multi colors, banding, broom, salt, exposed aggregates, staining, and unlimited combinations of these. Q: Will the value of my home increase with a pool? A: It will. Studies reveal that pools increase your home value betwee 7% and 15%. It depends on the locations of your home. Q: Will a pool increase the value of my home? A: Yes. Most studies show that a pool will increase the value of your home anywhere between 7% and 15%, depending on where your house is located. Q: What is the greatest factor affecting the swimming pool cost? A: Interestingly, the cost of construction for the structure of the pool does not vary much. The ease of access to your property, local permits, and the demolition before construction can affect the prices slightly. The biggest cost increase is due to what you place around the pool to enhance the design. The materials that are used in the waterfalls, the planter walls, the deck, the patio, and other features can be very simple or very elaborate. So since you will have the greatest control of the cost by monitoring what goes around the pool for design.